Opportunities abound on this delightful vacation to learn about France and the French. Your adventure begins with an overnight on the French Riviera, also known as the Côte d’Azur. Then, travel to Arles in the Provence region to board your ship and (daylight permitting) sail into the peaceful Camargue area during dinner, before returning to Arles. Avignon, charming Viviers, medieval Tournon, Vienne, France’s gastronomic capital of Lyon, as well as , Chalon-sur-Saône, and fascinating Beaune await you in France. Travel by motorcoach to Basel and embark on a mesmerizing journey along the Rhine. Enjoy guided sightseeing in Strasbourg, Koblenz, and Cologne, as well as an excursion to Heidelberg, Germany’s oldest university town. 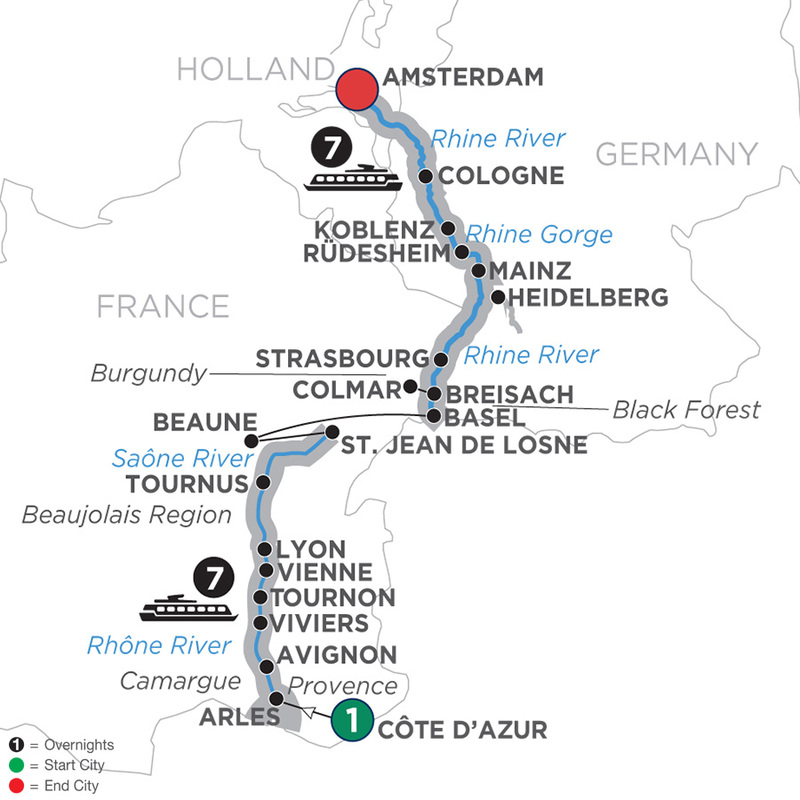 Sail through the dramatic Rhine Gorge, the most beautiful stretch of river dotted every mile with castles. Visit the Gutenberg Museum in Mainz, see the legendary Lorelei rock, and enjoy a canal cruise in splendid Amsterdam. Be sure to pack your camera so you can capture the romance and splendor of this magical journey. Day 1 Arrive in Côte d’Azur, France. Welcome to France! Located between the mountains and the deep-blue Mediterranean Sea, the Côte d’Azur is synonymous with prestige and beauty with its enchanting yachts, glamorous villas, and famous events. Time at leisure lets you get acquainted with this amazing place.